How important is the World Wide Web to information retrieval and communication? Important enough that information professionals have seen students exit from their libraries en masse when Internet service was lost. Internet providers dominate the indexing and abstracting of periodical articles as major publishers now offer nearly all of their reference titles in digital form. Libraries spend increasing amounts of funding on electronic reference materials, and librarians devote an increasing amount of time to assisting in their use. The Reference Collection: From the Shelf to the Web is an essential guide to collection development for electronic materials in academic and public libraries. The Reference Collection: From the Shelf to the Web tracks the continuing evolution of electronic reference resources-and how they’re accessedin a variety of settings. Librarians representing university, elementary school, and public libraries in the United States and Australia examine how reference collections have evolved over time (and may soon be a thing of the past); how public and school libraries have dealt with the changes; why library research assignments have become more difficult for teachers to make and for students to complete; how to organize online reference sources; and why the nature of plagiarism has changed in the electronic era. The book also examines the use of electronic references from a publisher’s perspective and looks at the most important Web-accessible reference toolsboth free and subscriptionin the areas of humanities, medicine, the social sciences, business, and education. 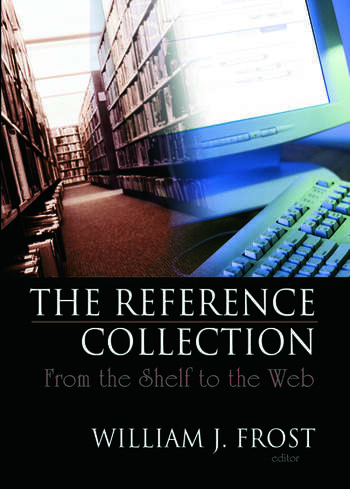 The Reference Collection: From the Shelf to the Web is an essential resource for all reference and collection development librarians, and an invaluable aid for publishing professionals.